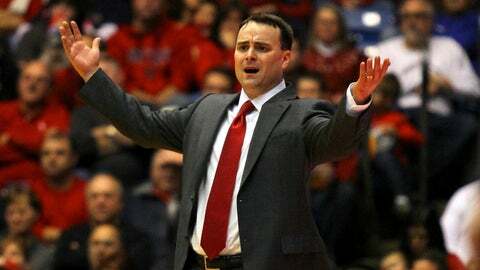 Coach Archie Miller's Flyers could not hang on to a halftime lead at Richmond on Saturday. RICHMOND, Va. (AP) — Kendall Anthony scored 18 points and Cedrick Lindsay added 17 as Richmond beat Dayton 73-64 on Saturday. Richmond (12-6, 2-1 Atlantic 10 Conference) scored its final 13 points on free throws, beginning on a three-point play by Lindsay that gave the Spiders a 61-60 lead with 5:13 to play. Richmond shot just 36.5 percent from the field but went 32 of 35 from the free throw line. Anthony hit 11 of 12 from the line and Lindsay made 11 of 13. Dyshawn Pierre made 8 of 12 field goals and scored 19 for Dayton (13-5, 1-2), which shot 51.1 percent from the field. The Spiders trailed nearly the entire first half but ultimately pulled away late after a second half that featured seven lead changes. Richmond took good care of the ball, committing only six turnovers.